The rental shop is going through a major upgrade this season. Manager Amanada Pilley came up with some great ideas....then realized she had created tons of work. But she and her crew are getting the job done and it looks great. Some of us never even realized there were so many windows in the shop! 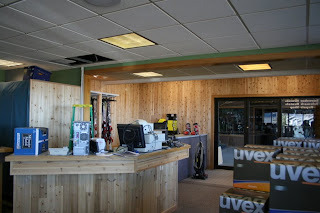 When you enter the shop, you'll see the telemark, cross-country and snowshoe center to your right. There are two registers to help the line move fast. 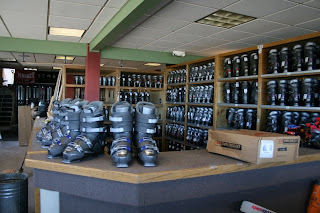 Skiers will go to a much easier boot corral this season before moving on to their skis. 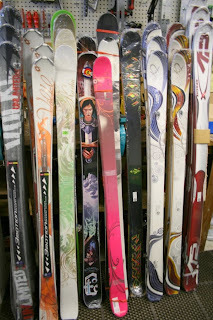 We've ordered lots of new skis for our high performance rentals. Stop by the rental shop this season to check out our Taste of Colorado high pro series featuring companies right here in Colorado. We've started with Icelantic and High Society. Im happy about the upgrades. I have my own skiis but now just in case if I need them, i can get another pair of twin tips. So now i have nothing to worry about at all.